An unusual, hand-drawn map of the Polish-Lithuanian Commonwealth from the second half of the 17th century was found in Paris by historians from the University of Bialystok - Dr. Wojciech Walczak and Dr. Karol Łopatecki. Scientists made the discovery during research and queries in the French State Archives. The map has dimensions 198 by 183 cm and the scale of 1 to 880 000. 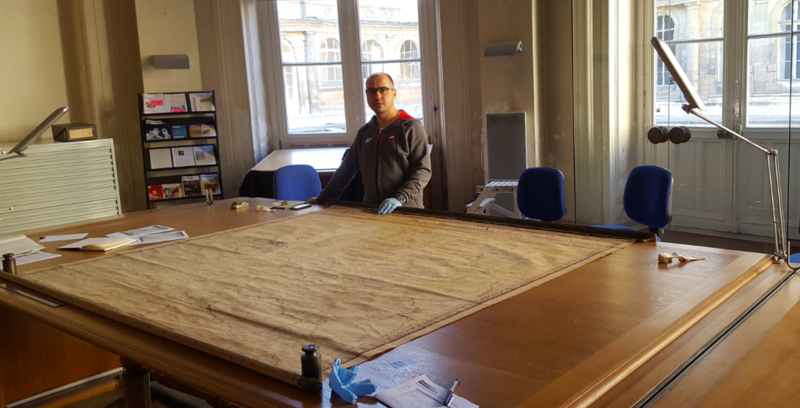 The map is in good condition, even the original staff with fragments of gilding and a fragment of the wooden frame have been preserved, the university reports. This large-format, hand-drawn map is entitled: CARTE ET DESCRIPTION GÉNÉRALE DES ESTATS DE LA COURONNE DE POLOGNE OÙ SONT LE ROYAUME DE POLOGNE, LES DUCHÉS DE PRUSSE, MAZOVIE, RUSSIE NOIRE, LE GRAND DUCHÉ DE LITHUANIE, LES PROVINCES DE VOLHYNIE, PODOLIE, UKRAINE OU PAYS DES COSAQUES, DIVISÉS EN LEURS PALATINATS, SUBDIVISÉS EN CHASTELLENIES (Map and general description of the lands of the Commonwealth depicting the Kingdom of Poland, the Prussian Principality, Masovia, Rus, Grand Duchy of Lithuania, Volyn, Podolia, Ukraine and the Cossack lands divided into voivodships with marked castellanies). Its author was probably Guillaume Sanson, an outstanding seventeenth century geographer and cartographer, who made it based on the detailed work of his father Nicolas (1600-1667), called the "father of French cartography". The researchers learned about the previously little known map in 2016. At the time, they studied the manuscript describing the lands of the Commonwealth at the Château de Chantilly in France. "It was a geographical description of the lands of Poland and Lithuania made by Sanson, containing detailed maps of the Commonwealth of Poland, including the descriptions of these areas, as well as a very large index of towns with geographical coordinates - reports Dr. Wojciech Walczak, quoted in the materials provided by the University of Bialystok. - It was based primarily on information previously prepared by another cartographer, Guillaume de Vasseur Beauplan, but it contained additional objects that added details to the image of the Commonwealth of Poland. This work indicated that a handwritten general map of the Commonwealth of Poland had to be created, different from other known printed versions". That object has been found and studied by historians from the Faculty of History and Sociology of the University of Bialystok. According to their preliminary findings, like the atlas of Chantilly, the map found in Paris was commissioned by the Dukes of Condé and prepared by G. Sanson. The scientists remind that already in 1660 the concept appeared of electing the king`s successor before the death of the ruling king (Vivente rege). The candidate supported by John II Casimir Vasa was the son of Louis de Bourbon, called le Grand Condé (1621-1686) - Henri Jules de Bourbon (1643-1709), Prince of Condé. These plans were not realized, but another opportunity presented itself after the death of Jan III Sobieski. Then the candidacy of François Louis de Bourbon, le Grand Conti, who was the nephew of le Grand Condé, was put forward. These persons should be associated with the creation of a description and map of the lands of the Commonwealth of Poland and the Grand Duchy of Lithuania. The detailed geographical description of the lands of Poland and Lithuania was intended to help in preparing for ruling the Commonwealth. The Sansons were entrusted with this task, explains Dr. Karol Łopatecki. Ultimately, neither Henri Jules de Bourbon nor François Louis de Bourbon would sit on the Polish throne, which is why the work was never published in print. Fortunately, two manuscript copies of the atlas have been preserved in the Library and Archives of the Château de Chantilly. "These sources still require detailed research, which will confirm the circumstances of their creation. We hope that in 2019 we will conclude our research with the publication of a monograph on this subject" - adds Dr. W. Walczak. Historians from Bialystok have been conducting studies of manuscript maps presenting the lands of the Commonwealth of Poland since 2008, as part of an international project under the supervision of Dr. Wojciech Walczak from the University of Bialystok and Prof. Andrew Pernal from the University of Calgary (Canada). The team also includes Dr. Mariusz Drozdowski (University of Bialystok) and Dennis F. Essar from the University of Edmonton (Canada). The project was supported by the Polonika Institute. The publication containing a translation of the description of the Polish-Lithuanian Commonwealth with Sanson`s maps will be published in 2019. Hand-drawn maps and plans of the Commonwealth of Poland from the modern period have already been the subject of research by Dr. W. Walczak and Dr. K. Łopatecki. The result of earlier queries was the publication "Maps and plans of the Polish Commonwealth of the 17th c. in archives in Stockholm, Vol. I and II" (Warsaw 2011), published in Polish and English by the Polish Ministry of Culture and National Heritage.